I found these shoes at Target the other day and thought they were pretty cute for the price. 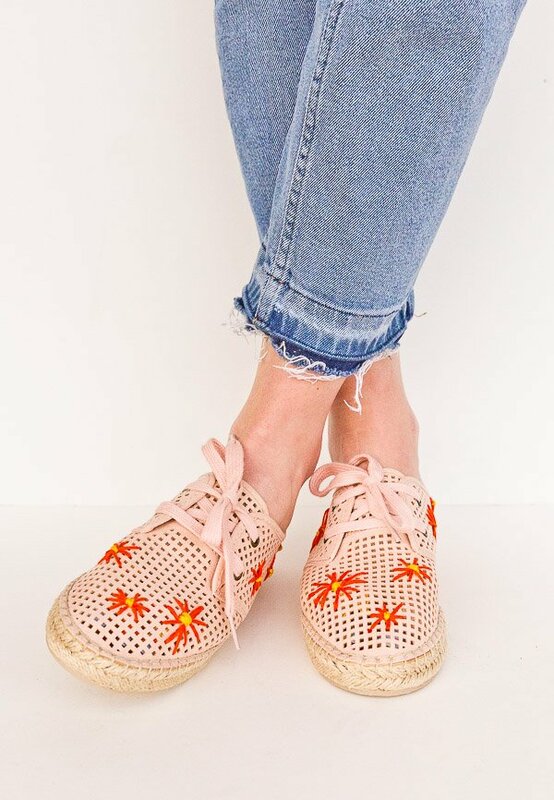 They’re perforated espadrilles and because of the holes, I thought they’d be perfect for a cross stitch or embroidery project. So, I whipped up 3 different ways to makeover a simple pair of shoes with essentially just a needle and thread. It’s way less messy that dying, painting, etc and is super customizable. Plus, if you ever get tired of the design you created, you can remove it without damage to the shoe and start fresh with a completely new look. 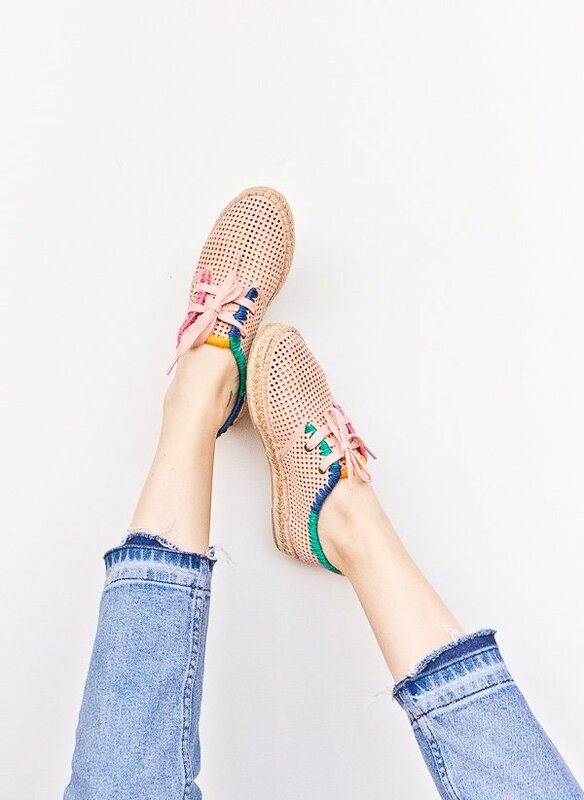 Click through for all 3 ways to makeover shoes for spring. This first idea is probably my favorite, especially for spring, since it involves flowers. Like the other two options, it’s extremely easy (YAY) and works seamlessly with the shoes. Doesn’t it look like the flowers were always there in the finished photos? Anyway, here’s how to make those flowers. Start with a double strand of embroidery floss and thread through needle. Then triple knot the end and go through the inside of the shoe to get started. For the petals, I just created a basic star / asterisk pattern of lines that will roughly the same length. Going through the existing holes to make it easy to get the needle through each side. And then to create the center, I used a new color embroidery floss, triple knotted again from the inside of the shoe and then poked through to the center and then wrapped around the center several times before knotting back through and tying it off in the inside. Cut off all loose string from the inside and they’re ready to wear. This is the quickest design of the three since it involves the least amount of stitching. For this simple pattern, start with a double strand of embroidery floss again and thread through needle. Then triple knot the end and go through the inside of the shoe to get started. Go through the existing holes with the needle and create a simple line pattern, alternating the hole height for each one to create an up and down design like mine. Repeat this process on both the side of the shoe and the toe. When finished, triple knot the inside of the shoe string and cut off any excess thread before wearing. This is the most time-consuming option of the three, but well worth it if you ask me. I love how these turned out and with more muted / neutral colors you can get even more subtle design if this one is a bit too bright. Last but not least, for this design you’ll need several colors. Start with a double strand of embroidery floss in one color and thread through needle. Then triple knot the end and go through the inside of the shoe to get started. I started at the tongue of the shoe to get the hang of it, and kept the entire tongue one color. So, to create this collar, around the whole top of the shoe, you’ll be going through the same top hole closet to the top several times each before moving onto the next hole. If you look closely at the photo, you’ll see there are multiple strands coming from one hole, all the way around. I found it most helpful to fan out each strand as it going through the hole to cover more of the top and create almost a subtle triangular or scalloped pattern. Once you’ll gone through the same hole 3-4 times, move onto the next hole. Once your ready to change colors, triple knot the end of the previous color through the inside of the shoe, and cut off any excess string. Then start on the next hole with the new color using the same process as the first (double threaded embroidery floss, triple knotted through the inside, going through the same hole 3-4 times and fanning out the thread, before moving onto the next hole). You can repeat this process with as many colors as you’d like. And once the entire shoe is finished, repeat this process with the other shoe and they’re ready to wear. Before wearing, as with the other shoes designs, be sure to triple the end of the inside of the shoe and cut off any excess string. So that’s it! 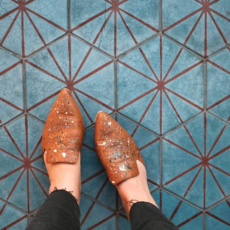 What do you think of these DIY ways to makeover shoes? Which design is your favorite of the three? I really like these DIY makeovers! So fresh and wonderful for spring! Those shoes look amazing! The blocked collar is my favorite design! That is such a good idea! I love how the shoes turned out. such a great shoe make over! Lovely and so creative.. The first one – Flower Power is my favorite design. As someone who’s customised plain cheap lace ups with sharpies before now(!) and an embroidery fan, I LOVE these! Oh the fun you can have 😀 Great post! My favorite design is the last one!!!! I am so doing this 😍😍😍👌🏻 thank you for the tutorial ! I LOVE these makeovers! 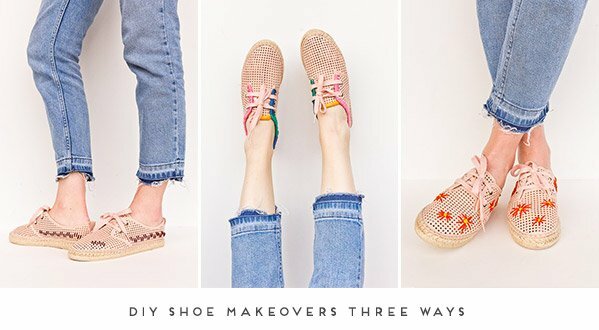 This is such a cool way to makeover those shoes- I especially love the color blocked ones! 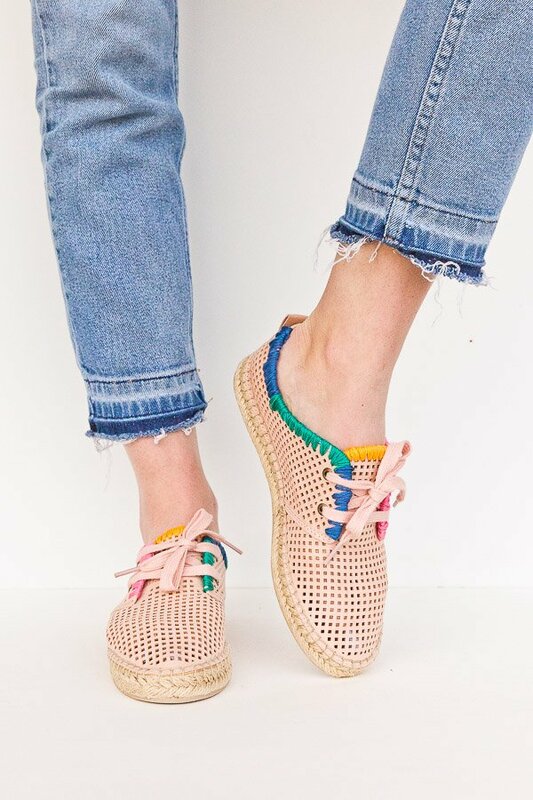 I’ve been wanting to DIY a pair of shoes for a while now, and these might be the ones I try! 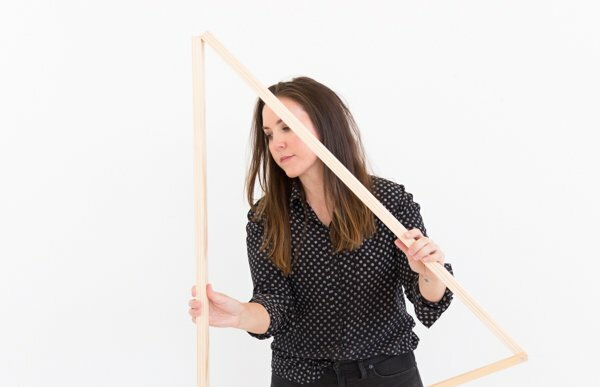 You are so creative with this DIY makeover. You inspire to do DIY projects on my own. Floral shoes are really trendy nowadays so I think I would love to do a floral shoes on my own like you did. That is a great idea! Love your post keep sharing more awesome ideas. This is the perfect idea! I think my daughter would love to do this sometime. Such a simple idea but I would never have thought about it.